 In Hinduism, Ganesha refers to the "lord of the hosts," also spelled as Ganesa and Ganesh, often also referred to as Ganapati) - and is one of the most well-known and venerated representations of God (Brahman). He is the first born son of Shiva and Parvati, and the husband of Bharati, Riddhi and Siddhi. He is also called Vinayaka in Marathi, Malayalam and Kannada, Vinayagar and Pillayar (in Tamil), and Vinayakudu in Telugu.  'Ga' symbolizes Buddhi (intellect) and 'Na' symbolizes Vijnana (wisdom). Ganesha is thus considered the master of intellect and wisdom. He is depicted as a big-bellied, yellow or red god with four arms and the head of a one-tusked elephant, riding on, or attended to by, a mouse. He is frequently represented sitting down, with one leg raised in the air and bent over the other. Typically, his name is prefixed with the Hindu title of respect, 'Shree' or Sri. The cult of Ganesha is widely diffused, even outside of India. His devotees are called Ganapatya.The ganapati festival is celebrated with great enthusiasm and devotion throughout India but in Mumbai, the financial capital of the Country, the festival assumes a special significance because of the scale at which it is performed. As is the case with every other external form with which Hinduism represents god, in the sense of the personal appearance of Brahman (also referred to as Ishvara, the Lord), the figure of Ganesha too is an archetype loaded with multiple meanings and symbolism which expresses a state of perfection as well as the means of obtaining it. Ganesha, in fact, is the symbol of he who has discovered the Divinity within himself.Ganesha is the first sound, OM, in which all hymns were born. When Shakti (Energy) and Shiva (Matter) meet, both Sound (Ganesha) and Light (Skanda) were born. He represents the perfect equilibrium between force and kindness and between power and beauty. He also symbolizes the discriminative capacities which provide the ability to perceive distinctions between truth and illusion, the real and the unreal. A description of all of the characteristics and attributes of Ganesha can be found in the Ganapati Upanishad (an Upanishad dedicated to Ganesha) of the rishi Atharva, in which Ganesha is identified with Brahman and Atman. According to the strict rules of Hindu iconography, Ganesha figures with only two hands are taboo. Hence, Ganesha figures are most commonly seen with four hands which signify their divinity. Some figures may be seen with six, some with eight, some with ten, some with twelve and some with fourteen hands, each hand carrying a symbol which differs from the symbols in other hands, there being about fifty-seven symbols in all, according to some scholars. 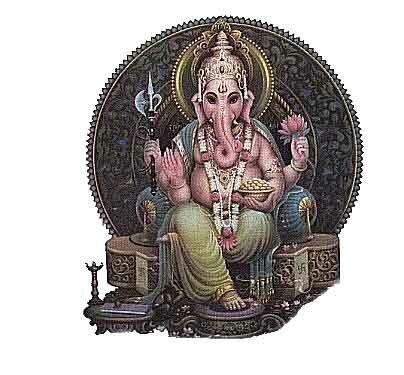 The image of Ganesha is a composite one. Four animals, man, elephant, the serpent and the mouse have contributed to the makeup of his figure. All of them individually and collectively have deep symbolic significance. The serpent or dragon is an archetype for DNA. In general terms, Ganesha is a much beloved and frequently invoked divinity, since he is the Lord of Good Fortune who provides prosperity and fortune and also the Destroyer of Obstacles of a material or spiritual order. It is for this reason that his grace is invoked before the undertaking of any task (e.g. traveling, taking an examination, conducting a business affair, a job interview, performing a ceremony,) with such incantations as Aum Shri Ganeshaya Namah (hail the name of Ganesha), or similar. It is also for this reason that, traditionally, all sessions of bhajan (devotional chanting) begin with an invocation of Ganesha, Lord of the "good beginnings" of chants. Throughout India and the Hindu culture, Lord Ganesha is the first idol placed into any new home or abode. Moreover, Ganesha is associated with the first chakra (energy wheel), which represents the instinct of conservation and survival, of procreation and material well-being. the position of his legs (one resting on the ground and one raised) indicate the importance of living and participating in the material world as well as in the spiritual world, the ability to live in the world without being of the world. the fourth hand holds a lotus flower (padma), and it symbolizes the highest goal of human evolution, the sweetness of the realised inner self. Ganesha is also defined as Omkara or Aumkara, that is "having the form of Om (or Aum) (see the section The names of Ganesha). In fact, the shape of his body is a copy of the outline of the Devanagari letter which indicates the celebrated Bija Mantra. For this reason, Ganesha is considered the bodily incarnation of the entire Cosmos, He who is at the base of all of the phenomenal world (Vishvadhara, Jagadoddhara). Moreover, in the Tamil language, the sacred syllable is indicated precisely by a character which recalls the shape of the elephant's head of Ganesha. The broken tusk of Ganesha, as described above, stands primarily for his ability to overcome or "break through" the illusions of duality. However, there are many other meanings that have been associated with this symbol. According to one interpretation, Ganesha's divine vehicle, the mouse or mooshikam represents wisdom, talent and intelligence. It symbolizes minute investigation of a cryptic subject. A mouse leads a clandestine life below the ground. Thus it is also a symbol of ignorance that is dominant in darkness and fears light and knowledge. As the vehicle of Lord Ganesha, a mouse teaches us to remain always on alert and illuminate our inner-self with the light of knowledge. Both Ganesha and the Mooshak love modaka, a sweet dish which is traditionally offered to them both during worship ceremonies. The Mooshak is usually depicted as very small in relation to Ganesha, in contrast to the depictions of vehicles of other deities. However, it was once traditional in Maharashtrian art to depict Mooshak as a very large mouse, and for Ganesha to be mounted on him like a horse.Yet another interpretation says that the mouse (Mushika or Akhu) represents the ego, the mind with all of its desires, and the pride of the individual. Ganesha, riding atop the mouse, becomes the master (and not the slave) of these tendencies, indicating the power that the intellect and the discriminative faculties have over the mind. Moreover, the mouse (extremely voracious by nature) is often depicted next to a plate of sweets with his eyes turned toward Ganesha while he tightly holds on to a morsel of food between his paws, as if expecting an order from Ganesha. This represents the mind which has been completely subordinated to the superior faculty of the intellect, the mind under strict supervision, which fixes Ganesha and does not approach the food unless it has permission. It is interesting to note how, according to tradition, Ganesha was generated by his mother Parvati without the intervention of her husband Shiva. Shiva, in fact, being eternal (Sadashiva), did not feel any need to have children. So Ganesha was born out of the exclusively female desire of Parvati to procreate. Consequently, the relationship of Ganesha and his mother is unique and special. This devotion is the reason that the traditions of southern India represent him as celibate (see the anecdote Devotion to his mother). It is said that Ganesha, believing his mother to be the most beautiful and perfect woman in the universe, exclaimed: "Bring me a woman as beautiful as she and I will marry her." In the north of India, on the other hand, Ganesha is often portrayed as married to the two daughters of Brahma: Buddhi (intellect) and Siddhi (spiritual power). Popularly in north India Ganesha is accompanied by Sarasvati (goddess of culture and art) and Lakshmi (goddess of luck and prosperity), symbolizing that these qualities always accompany he who has discovered his own internal divinity. But this does not mean that Sarasvati and Lakshmi are consorts of Ganesha. Symbolically this represents the fact that wealth, prosperity and success accompany those who have the qualities wisdom, prudence, patience, etc. that Ganesha symbolizes. How did he obtain his elephant head? The highly articulated mythology of Hinduism presents many stories which explain the manner in which Ganesha obtained his elephant head; often the origin of this particular attribute is to be found in the same anecdotes which tell about his birth. And many of the these same stories reveal the origins of the enormous popularity of his cult. The most well-known story is probably the one taken from the Shiva Purana. Once, while his mother Parvati wanted to bathe, there were no attendants around to guard her and stop anyone from accidentally entering the house. Hence she created a boy's idol out of turmeric paste which she prepared to cleanse her body (turmeric was used for its anti-septic and cooling properties) and infused life into it, and thus Ganesha was born. Parvati ordered Ganesha not to allow anyone to enter the house and Ganesha obediently followed his mother's orders. After a while Shiva returned from outside and as he tried to enter the house, Ganesha stopped him. Shiva was infuriated at this strange little boy who dared to challenge him. He told Ganesha that he was Parvati's husband, and demanded that Ganesha let him go in. But Ganesha would not hear any person's word other than his dear mother's. Shiva lost his patience and had a fierce battle with Ganesha. At last he severed Ganesha's head with his Trishula (trident). When Parvati came out and saw her son's lifeless body, she was very angry and sad. She demanded that Shiva restore Ganesha's life at once. Unfortunately, Shiva's Trishula was so powerful that it had hurled Ganesha's head very far off. All attempts to find the head were in vain. As a last resort, Shiva approached Brahma who suggested that he replace Ganesha's head with the first living being that came his way which lay with its head facing north. Shiva then sent his celestial armies (Gana) to find and take the head of whatever creature they happened to find asleep with its head facing north. They found an elephant which slept in this manner and decapitated it, attaching the elephant's head to Ganesha's body and bringing him back to life. 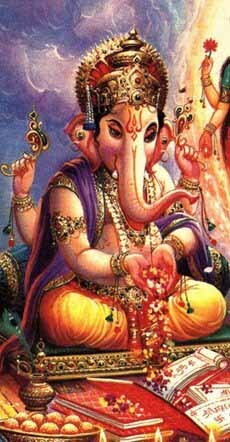 From then on, he was called Ganapathi, or head of the celestial armies and was to be worshipped by everyone before beginning any activity. Another story regarding the origins of Ganesha and his elephant head narrates that, once, there existed an Asura (demon) with all the characteristics of an elephant, called Gajasura, who was undergoing a penitence (or tapas). Shiva, satisfied by this austerity, decided to grant him, as a reward, whatever gift he desired. The demon wished that he could emanate fire continually from his own body so that no one could ever dare to approach him. The Lord granted him his request. Gajasura continued his penitence and Shiva, who appeared in front of him from time to time, asked him once again what he desired. The demon responded: "I desire that You inhabit my stomach." Shiva granted even this request and he took up residence in the demon's stomach. In fact, Shiva is also known as Bhola Shankara because he is a deity easily propitiated; when he is satisfied with a devotee he grants him whatever he desires, and this, from time to time, generates particularly intricate situations. It was for this reason that Parvati, his wife, sought him everywhere without results. As a last recourse, she went to her brother Vishnu, asking him to find her husband. He, who knows everything, reassured her: "Don't worry, dear sister, your husband is Bhola Shankara and promptly grants to his devotees whatever they ask of him, without regard for the consequences; for this reason, I think he has gotten himself into some trouble. I will find out what has happened." Then Vishnu, the omniscient director of the cosmic game, staged a small comedy. He trasformed Nandi (the bull of Shiva) into a dancing bull and conducted him in front of Gajasura, assuming, at the same time, the appearance of a flutist. The enchanting performance of the bull sent the demon into ecstasies, and he asked the flutist to tell him what he desired. The musical Vishnua responded: "Can you give me that which I ask?" Gajasura replied: "Who do you take me for? I can immediately give you whatever you ask." The flutist then said: "If that's so, liberate Shiva from your stomach." Gajasura understood then that this must have been no other than Vishnu himself, the only one who could have known that secret and he threw himself at his feet. Having liberated Shiva, he asked him for one last gift: "I have been blessed by you with many gifts; my last request is that everyone remember me adoring my head when I am dead." Shiva then brought his own son there and substitued his head with that of Gajasura. From then on, in India, the tradition is that any action, in order to prosper, must begin with the adoration of Ganesha. This is the result of the gift of Shiva to Gajasura. A less well-known story from the Brahma Vaivarta Purana narrates a different version of Ganesha's birth. On the insistence of Shiva, Parvati fasted for a year (punyaka vrata) to propitiate Vishnu so that he would grant her a son. Lord Krishna, after the completion of the sacrifice, announced that he would incarnate himself as her son in every kalpa (eon). Accordingly, Krishna was born to Parvati as a charming infant. This event was celebrated with great enthusiasm and all the gods were invited to take a look at the baby. However Shani (Saturn), the son of Surya, hesitated to look at the baby since Shani's gaze is said to be harmful. However Parvati insisted that he look at the baby, which Shani did, and immediately the infant's head fell off and flew to Goloka. Seeing Shiva and Parvati grief stricken, Vishnu mounted on Garuda, his divine eagle, and rushed to the banks of the Pushpa-Bhadra river, from where he brought back the head of a young elephant. The head of the elephant was joined with the headless body of Parvati's son, thus reviving him. The infant was named Ganesha and all the Gods blessed Ganesha and wished Him power and prosperity. Another tale of Ganesha's birth relates to an incident in which Shiva slew Aditya, the son of a sage. Shiva restored life to the dead boy, but this could not pacify the outraged sage Kashyapa, who was one of the seven great Rishis. Kashyap cursed Shiva and declared that Shiva's son would lose his head. When this happened, the head of Indra's elephant was used to replace it.Still another tale states that on one occasion, the used bath-water of Parvati was thrown into the Ganges and this water was drunk by the elephant-headed Goddess Malini, who gave birth to a baby with four arms and five elephant heads. The river goddess Ganga claimed him as her son, but Shiva declared him to be Parvati's son, reduced his five heads to one and enthroned him as the Controller of Obstacles (Vigneshwara). In the first part of the epic poem Mahabharata, it is written that the sage Vyasa asked Ganesha to transcribe the poem as he dictated it to him. Ganesha agreed, but only on the condition that Vyasa recite the poem uninterruptedly, without pausing. The sage, in his turn, posed the condition that Ganesha would not only have to write, but would have to understand everything that he heard before writing it down. In this way, Vyasa might recuperate a bit from his continuous talking by simply reciting a difficult verse which Ganesha could not understand. The dictation began, but in the rush of writing Ganesha's pen broke. He broke off a tusk and used it as a pen so that the transcription could proceed without interruption, permitting him to keep his word.